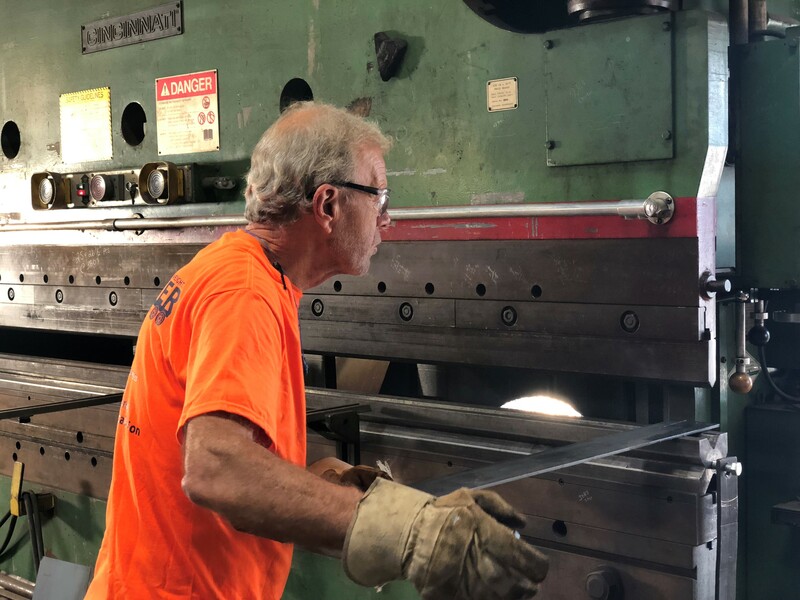 At Boulter, our steel fabrication shop features a collection of high-quality equipment to streamline the entire fabrication process. By offering many different fabrication processes under one roof, we enable you to more effectively manage the cost of your project. From design to product manufacturing, our streamlined manufacturing process allows us to produce a high-quality product in a cost-effective manner. Boulter owns and operates innovative fabrication equipment. Some of our larger pieces include a hydraulic shearing machine, the Piranha Ironworker, a large press brake, and an overhead crane. These machines, along with our highly-skilled staff, allow our fabrication shop to turn your concepts into high-quality finished products. Our hydraulic shearing machine gives our fabrication shop a competitive advantage for handling metal in bulk. The durability of the equipment and its ability to handle up to 1/2-inch steel means that we can manage all sizes of projects without issue. Using a guillotine cutting system, large sheets of metal are effortlessly cut to be used for production. 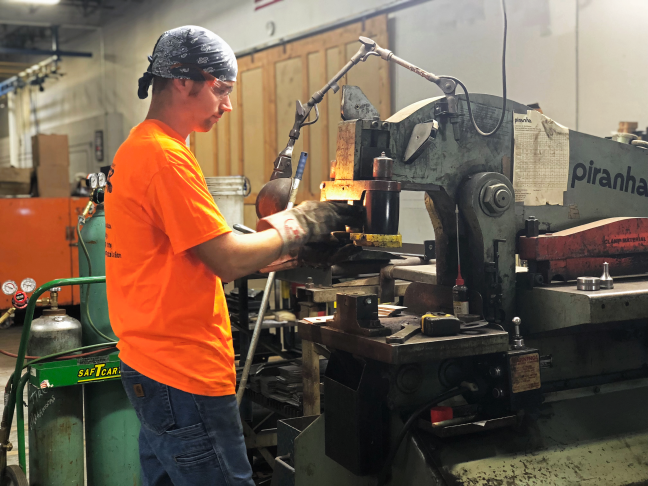 The Piranha Ironworker is a fundamental component of our fabrication shop. This machine has the ability to notch, hole punch (thin and thick material), angle and plate shear within seconds. These applications, typically performed across multiple machines, can all be completed on the Piranha Ironworker. This allows us to utilize less equipment and manpower while increasing our production and decreasing your costs. Bending, an important application in the metal forming process can be completed by Boulter in-house. This reduces the need for sub-contractors and helps control costs. Our hydraulic press brake is capable of bending simple and complex steel pieces up to one inch thick. The overhead crane is our main means of material movement. The use of the overhead crane ensures that full-capacity loads are transported efficiently throughout our workshop. This advantageous system maximizes shop space and minimizes material handling. The reduction in handling time translates to savings for our customers. Working with Boulter means that things get done right the first time, every time. Our employees have years of field and shop experience. Their experience combined with training on our innovative machines minimizes or eliminates the need for sub-contracting. The ability to conduct all services in-house reduces errors and allows Boulter to provide high-quality service at cost-effective pricing.